Commercials are still a bit too cold and clear to poke a tiny rig tight to rushes in 18ins of water. 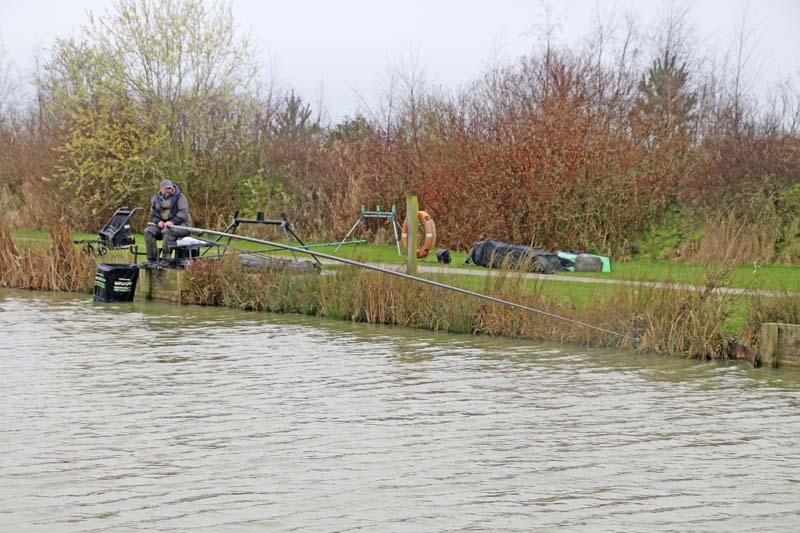 So while you’re waiting for things to pick up you’ll need to find a spot of deeper water a metre or so further out from the bank – something that Spotted Fin man Andy Dyson calls his ‘secret’ margin swim at his local venue Old Hough Fishery near Sandbach, Cheshire. “Very occasionally you’ll catch here early in the match, but most of the time it’s classic ‘margin’ fishing, the final two hours being the time to concentrate your efforts here,” he explained. “I try to fish and feed just inches from the edge of the second shelf before it goes into the deep water. That way the fish don’t need to expend much energy to find my bait. I’ll also fish well away from my platform until the water colours up – we’re talking 11m to 13m on the pole. “This distance puts you in front of the fishing pallet next door and this is where the fish know they’ll get fed from bait thrown in at the end of the day,” Andy continued. “If you’ve got the space I would definitely have two of these lines on the go down either side. This not only doubles the chances of catching well but will also let me feed differently,” Andy said. “Generally I’ll use a small pot and trickle in six grains of corn and a few micro pellets, but if things aren’t going to plan, dumping in a big hit of bait with a pole cup can do the trick. Having two lines lets me do both and decide which is better. “Feeding will begin after an hour because if things are going well I will have a look on this line after two hours of a match,” he continued. “In goes a small pot of corn and Spotted Fin GO2 F1 micros, to which I give a good squirt of GO2 F1 Liquid Food. I’ve caught a lot of fish using this stuff and think it can do no harm when every bite is precious. “Once I begin fishing here I drop in another small pot of feed after every fish, bite or indication as I’m not trying to pull in a mass of fish – and besides, I don’t think the fish want a lot of bait in the first place,” he added. “It’s crucial to plumb up and set the float at dead depth, not only to prevent line bites when the fish arrive, but to let me know quickly if the rig is off course – should it be an inch or two into the deep water it will sink with the weight of the corn hookbait and I can reposition it immediately,” Andy said. “Dead depth produces positive bites and, at times, the big F1s can rip the elastic out before you’ve lifted the pole as they move into the shallower water, take the corn and swim off! “Lines are 0.16mm main to an 0.12mm hooklink, both Middy Lo-Viz to a size 18 Middy KM4 hook – quite big enough for carp. “My elastic is Middy’s pink grade Reactarcore and my float for here is Warren Peaty’s Pukka model in the 4x12 size. “For the hook you can’t beat corn, one or even two grains if the fishing is good. “Pellet just doesn’t seem so productive, and on the match lakes at Old Hough there’s been a stocking of small F1s that just love pellets. “I’ll not spend much time fishing here unless I’m getting bites, as I can spend my time better elsewhere in the peg. “First job is to find the key area to fish and at Old Hough, a lot of the snake lakes actually have two marginal shelves to go at,” Andy said. “I will use the plummet to find the very edge of the second shelf, which can be two or three metres out from the bank. This offers enough water for the carp and F1s to feed confidently in but, more importantly, allows me to pick them off as they move up from the deepest water in the middle of the lake. “Chances are the fish won’t move all the way into the very shallow water but by fishing this second shelf, you can pick them off late in the day while other anglers will be trying to catch tight into the bank.